On November 2, 2010 the voters in Denver unfortunately turned down the suggestion to create an extraterrestrial affairs commission. The Denver Post writes that 84% voted against the so-called "Initiative 300". Jeff Peckman from The Extra Campaign who is behind the initiative has allegedly expressed that the result was better than he had expected. However, the ballot initiative has created more awareness of the disclosure cause. Read more in The Denver Post. The director of UN's Office for Outer Space Affairs (OOSA) in Vienna was in the spotlight at a press conference held on October 14th, 2010. She informed the journalists about her office's mandate and the sources of funding. The former is partly to advise the member states on the peaceful uses of space, including the application of nuclear power. Othman used the occasion to once more underscore that she has not been appointed as an "alien ambassador", as claimed by The Sunday Times some weeks prior to the event. The press was eager to know Othman's own opinion on how the UN should react in the case of earth being contacted by intelligent life from outer space. She emphasised that this was for the member states to decide and was thus reluctant to elaborate on her personal views. Othman played in other words the role of the neutral functionary, but did however stress that "contact" should be dealt with by all the nations of the world and not a single nation or just a single field of study. We found it interesting to observe how she and the audience handled the subject of contact with intelligent extraterrestrial life. Only a little progress can be traced when it comes to the "maturity" of dealing with the subject and to the institutionalisation in general. "Contact" is still not an explicit part of the mandate and the handling of the topic is still associated with a lot of awkwardness, nervousness, and giggling. It is our feeling that Othman is aware of the "size" of this subject and its complexity and great potential for social implications and complications. But how much she actually knows about the extraterrestrial presence is unknown. Watch the press conference here. After Disclosure - New Book! Richard Dolan's and Byce Zabel's new book "A.D.- After Disclosure" is out now. 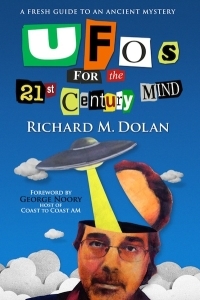 Buy it from Dolan's website: www.keyholepublishing.com. About the book: "What if UFO secrecy ended tomorrow? What happens when the powers-that-be finally admit that we are not alone? And that the Others we share the universe with are not light years away, some kind of cosmic pen-pals chatting by radio telescope, but are here, now. How will the truth change our society and your life? A.D. After Disclosure is the first work of non-fiction to tackle these questions about the new winners and losers in government, science, religion, media, culture, law, education, and politics. Life will go on, but it will never be the same." The former Lieutenant General Mamoru Sato from Japan has published a book which contains information about colleagues' UFO-observations. Read more about Mamoro Sato's book here.